I’m delighted to trumpet about an exciting new project which I’m a small part of. My friend Marcus Gipps, an editor at the fantasy and science fiction publisher Gollancz, is a lifelong fan of the Uncle books by J. P.Martin. These are a series of six children’s books published in the 60s and 70s which relates the adventures of a pompous elephant just called “Uncle” who lives in a staggeringly vast castle called Homeward. As well as exploring his own infinitely large house, he must constantly do battle against the anarchist Beaver Hateman who lives in the rival castle of Badfort. From this brief description it may sound a bit like Babar the elephant, or innumerable other children’s novels. But as soon as you read a page or two of these books, you realise you are in the presence of a startlingly original imagination. The court of Uncle contains a one armed badger who is always there, but seldom speaks. One of the main characters at Badfort is Jellytussle, a creature made entirely of jelly. The family who run Uncle’s art gallery are terrorised by a giant slimy fist which reaches through windows to grab them. The tallest tower in Homeward turns out to contain a Fritzl–like colony of children who have never been outside it. These mindbending jolts just keep on coming. Over the years, the books have picked up a lots of famous admirers including Spike Milligan, Will Self and Neil Gaiman. 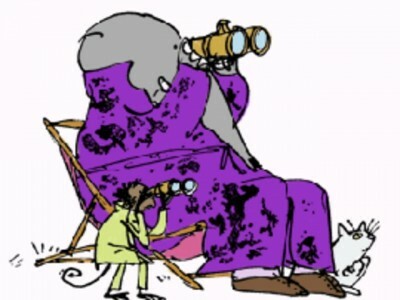 Best of all, the illustrations are by Quentin Blake, surely the seminal children’s book illustrator of the 20th century. Surprisingly,despite all this cult success, the books have been out of print for years. tatty old paperback editions now change hands for hundreds of pounds on eBay. Marcus decided it was time to get the books back out in the world – so he has made a kickstarter to get them published in a single beautifully bound volume. The kickstarter went to live yesterday (27th March) with a target of £7000 – which it smashed through in four hours flat. So the reissue is definitely going to happen. I’m doing a new drawing of uncle for the book, and writing an introduction. Other drawings and/or introductions will come from Martin Rowson, Neil Gaiman, and others. It will be on high-quality acid free paper. if you buy a copy through the kickstarter there are all kinds of options for goodies you can get with it, starting with getting your name in the thanks when it’s published. The book will cost £30 – which I know is a bit of money, but you’re getting six whole books in one volume for this, plus all the additional material from myself and others. Follow the link to the Kickstarter to find out more. but, really, I can’t recommend Uncle enough to you. It’s the great lost gem of British children’s literature.